I did not immediately recognize the statement he referred to. My initial thought was that, in any case, what several writers of literature said, however politically active they may be, really didn’t mean much, but I was curious about what he was referring to. So I asked him for citation. Though Yaacov was not able, due to constraints on his time, to clarify the source, I realized shortly that what he referred to was a Joint Statement organized by Yossi Beilin and Yasser Abbed-Rabbo in July 2001. I had, actually, referred to this statement many times in public talks I’ve given as an example of the extent to which the two-state solution was a real possibility. 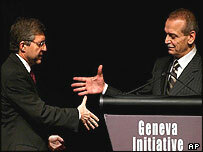 This project eventually led to the Geneva Initiative.